Tobias's home is without water. Perhaps its the nearby construction, perhaps its something....larger. Can he reinvent the rituals of his youth - rituals he can't quite remember - and create something that will be worth the water? 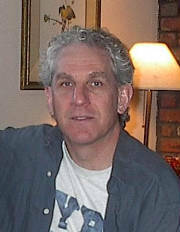 Steven Schutzman (Playwright) is a playwright and fiction writer, the author of dozens of published plays produced at such theaters as New Jersey Repertory, Cleveland Public, Circus Theatricals, Rochester Repertory and Baltimore Theatre Project. Steven is a six-time recipient of Maryland State Arts Council Individual Artist Grant Awards and a three-time top-tier finalist for the Eugene O’Neill Center’s National Playwright Playwrights Conference. His play A Question of Water was the winner of the Across The Generations New Jewish Play Festival and his one-act Tree Man won the First Stage L.A. One Act Contest. Tzipora Kaplan (Director) is delighted to stretch her directing muscles with A Question of Water in the Jewish Plays Project OPEN residency. Her most recent theatrical adventures were Black Milk (GM/PM) at the East 13th Street Theatre, Magic Trick (PM) in the NY Fringe Festival, The New York Innovative Theatre Awards (Associate Producer), The Austerity of Hope (PM) at The Abingdon Theatre, and The Man Under (GM) at 59E59. She's also house managed and hung lights, programmed a board (terribly), and wardrobed her way through the annals of the indie theater community. She thinks wistfully of the Ice Capades and unashamedly loves pop music and sparkly things. She sends all the naughty monkeys in the world to David Winitsky, and sincerely hopes that one day she will have the guts to be irreverent in her bio.